SB Nation’s Jeff Cox previewed the Hockey East quarterfinals on The Pipeline Show. The DraftAnalyst.com reviewed several draft eligible members of the NTDP U18s, including 2017 recruit David Farrance, at the recent NAHL Top Prospects Tournament. Farrance has 28 points (5G, 23A) in 49 games. LHD David Farrance (6/23/99, 5’11/180): Farrance is clearly one of the top two-way defensemen available for the draft, and we’ve seen enough of him to boldly confirm his reputation as a quality power play quarterback with top-four upside. We feel he doesn’t get enough credit for his defensive play, and being under six foot is part of the reason why. 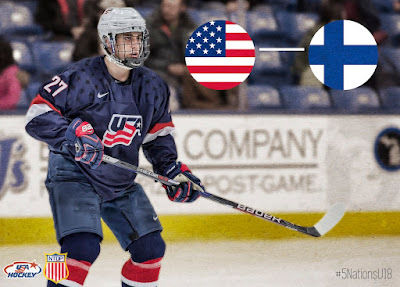 Still, he’s the NTDP’s top defenseman who logs top-pairing minutes, runs the power play and kills penalties. Farrance is capable of winning puck battles against bigger older players — he’s done it against NCAA competition and again last night, so we can only hope this gets recognized as he nears the draft. He did, however, make a critical turnover that led to a 2-on-0, but his reaction was quick enough to break up the play before a chance materialized. Farrance’s positioning was solid and used his lower body strength to keep his man near the cage clear of shooting lanes. Eichel continues piling up points with his 3rd point of the night. Jack Eichel scored twice (#s 17 & 18) and added an assist for the Sabres, who fell to Philadelphia, 6-3. Eichel extended his scoring streak to 11 games, second longest in the NHL this season. His goal in the second period gave him 100 career points in 127 games. Colin Wilson scored his 12th goal in Nashville’s 4-3 shootout loss to Anaheim. He is one of three ex-Terriers, along with Wade Megan and Chris Bourque, who are among the top 10 AHL scorers. O'Regan is also the top-scoring AHL rookie. Megan, with four goals in his last three games, tops the AHL with 27. Ahti Oksanen had a pro career best five points—a goal and four assists—in ECHL Greenville’s 7-3 win against Wichita. He has 42 points (18G, 24A) in 40 games. Mary Parker, star forward from @BUwhockey has signed with @TheBostonPride.